I wasn’t planning to review any of these books. I’ve read them all so many times, and they are all hopelessly outdated, especially Neither Here Nor There and The Lost Continent. These are books that I read and adored when I was younger, that helped me dream about a world outside of the small town I grew up in, and that even led to an aborted solo road trip when I was 21. Reading them after many years away brought back sweet memories, but there’s just not much place for them in 2018. 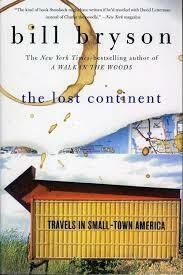 The Lost Continent came first, in the late 80s: it’s the story of Bryson driving around the U.S. searching for the “perfect” small town. He visits small towns and big cities all over the country, going to something like 38 states altogether. Bryson grew up in a small town in Iowa, then moved to England after meeting his future wife there while backpacking through Europe. He was 36 when he traveled through the U.S. for this book. I grew up in a small town in Indiana, and I’m 36 now, so reading The Lost Continent felt different than it did when I was younger–I understood his nostalgia for the time he grew up in, and the longing for a place that felt like his childhood. At the same time, the discussions about race in the U.S., while well-intentioned were embarrassingly dated. Another thing that dates it: our current President is described as, “a guy named Donald Trump, a developer.” Oh, for those halcyon days when he was nothing more than the guy who built a skyscraper with a lobby full of blotchy red marble, “like being inside someone’s stomach after he’d eaten pizza”! 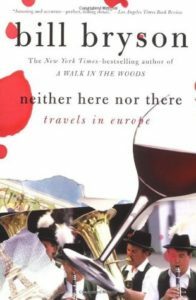 Neither Here Nor There, a travelogue of Europe soon after the fall of the Berlin Wall, starts with Bryson in Norway hoping to see the Northern Lights. He travels through 14 countries, finishing with Turkey. When I was younger this was my favorite of the three books, mainly because I had recently visited some of the places he described. Now, though, it was the one that took me the longest to read. It’s not the book’s fault that it’s 30 years old, and some of the countries Bryson visits don’t even exist anymore, but it did make it a bit difficult to get through. One thing I always enjoy in a Bryson book, though, is when he gets inadvertently drunk in a foreign land (you’d think after years as a travel writer he would learn, but no). In Neither Here Nor There, the best incident of this happens in Split, where he has to drunkenly navigate a maze of identical streets, cross a wooden plank over a ditch (when he slips, he breaks his fall with his crotch), and find the right door in an apartment building where he has rented a bed for $5. I’m a sucker for a little slapstick, so scenes like this are right up my alley. The third one written of the three was Notes from a Small Island, from the mid-90s. Bryson and his wife had decided to move to New Hampshire, so he traveled around England as a sort of farewell after living there for 20 years. In addition to describing his travels, he spends a great deal of time reminiscing about his time living there. Notes from a Small Island feels less dated than the other two. It used to be my least favorite of the three, but th is time around I enjoyed it the most. 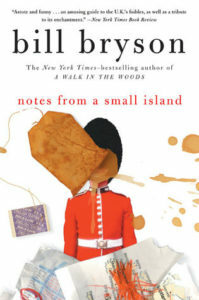 Bryson’s fondness for his adopted country is palpable, which makes it a pleasant read, full of loving description of the English countryside, including this line which was my favorite: “For miles around, the Dorset hills rolled and billowed, like a shaken-out quilt settling onto a bed.” Isn’t that nice? Doesn’t it make it sound like a cozy place? I think Notes from a Small Island is the only one of those three that I might read again someday. Something that is inevitable in any book by Bryson is that I will get sidetracked and fall down a Wikipedia-hole. I learned all about the Royal Family of Liechtenstein, the Wapping dispute, and rather more than I cared to know about the Donner Party. I learned, too, that Bryson takes a certain amount of creative license with his writing. This makes sense, of course, but when I read these as a teen that point was mostly missed on me. I don’t think I ever REALLY believed that the Lord Mayor and his wife have a “ceremonial pee” in the stairwell of each new London car park, but I think I really did miss many of the jokes, thinking they were true. Now I’m far too old and wise to believe that the only way to Capri is up an ancient staircase cut into the side of the hill that goes up and up for 100s of steps. The problem is that the world was much more magical before I was wise enough to know this. Share the post "You Expect Me to Believe Everything You Say, Well, Okay"
I’m using a Bryson for one of my squares, too! Wait, or am I getting that confused with my Read Harder Challenge? Either way, I’m going to be reading A Walk in the Woods. I haven’t read a book of his in years, but I have very fond memories of Notes From a Small Island as well as In a Sunburned Country. I adore In a Sunburned Country. Reread it a few years ago for CBR and it still held up, more than some of his others. I think since part of his whole shtick is “grumpy middle-aged white guy,” some things he says just seem off-putting at this particular juncture in history. But I remember loving A Walk in the Woods, although it’s been years! I loved In a Sunburned Country, too. I hated Neither Here Nor There when I read it – it seemed like he really didn’t want to be on the trip and missed the balance between slightly grumpy guy who enjoys traveling to just being unhappy with every single thing going (I may have been on the defensive since I was living in Germany and he really didn’t seem to like any of the cities I enjoyed visiting in Europe). All this talk is making me want to read In a Sunburned Country again! It’s definitely my favorite of his. Neither Here Nor There and The Lost Continent both err on the too-grumpy side at times, but did you read The Road to Little Dribbling? Sheesh. It’s Bryson at his most crotchety.